of the Museum of the Battle of Wagram, the Museum of the local history of Deutsch-Wagram and the memorial room of the Infantry Regiment No 42 Ernst August Duke of Cumberland, Duke of Brunswick and Lueneburg. The museum of the Battle of Wagram give's an overview of the battle that took place here on the 5th and the 6th of July 1809. The battle was fought between the French Empire and the Austrian Empire. The Austrian Army was led by Archduke Charles the French Army was led by Napoleon I. In the museum of the local history there is a setup of an old cobbler workshop from the time between WWI and WWII and a kitchen with an open fire place. There is a great number of ceramic and pottery and some exhibits from prominent local persons. The memorial room of the Infantry Regiment No. 42 offers a choice of uniforms from the time before 1914, a chronological table of the Regiment and memorabilia from former regiments commanders. The importance of the house. The historical building is opened to the public on Sundays between April and November. In the time from 10 AM to 4 PM. Deutsch-Wagram is next to the highway S1 Exit Süssenbrunn direction Gänserndorf. 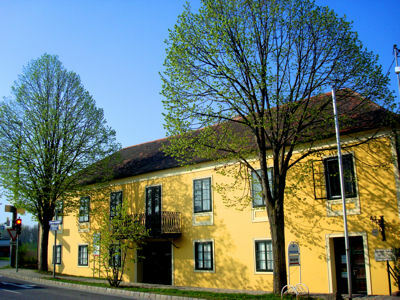 The museum is situated at the beginning of Deutsch-Wargram on the left hand side.